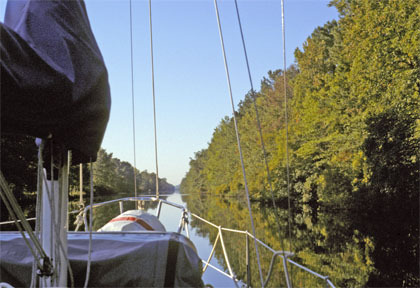 This canal is one way you can take the Intracoastal Waterway from the Chesapeake to Cape Hatteras. It is dead straight for a section of 20 miles but is bordered by lush tree growth and I found it fascinating. Saw many turtles sunning themselves on logs. It is rated for just six feet of depth and I did bounce over the odd log or whatever on the bottom. An extraordinary place where the town council go to great lengths to welcome cruising sailors. As soon as you dock at the town docks the female of the crew is presented with a red rose (they didn't know what to do with me - I believe I got the rose anyway.) They give you maps of the city, the use of a free bicycle, and people to call if you needed any help with anything! I had no idea what to expect in this part of the world but Charleston was quite a surprise. The architecture, the slow pace of life, and the beautiful flowers everywhere made it a very pleasant visit. Young girls were often in long dresses, boys in white suits, reminiscent of the '50s. Many really beautiful neighbourhoods, Martha Stewart would approve. 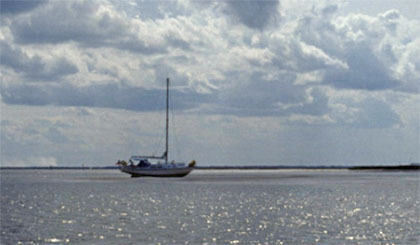 Typical of anchoring on the ICW, a group of four sailboats had anchored on a branch of the river which was part of the ICW. At about 2:00 am I was awoken by sounds of excited voices and lights flashing. I went on deck and saw the 35' Colin Archer double-ender anchored in front of me leaning out from the bank of the river it was closest to. This couple had anchored a little too close to the bank, and perhaps underestimating the tidal drop, were now hard aground. They used their dinghy and a line to get a feel for the depths around their boat and found out there was a steep drop off on the river side of their boat. The problem was the tide still had another 5' to drop and by then their boat would be lying completely on its side. Their concern, highlighted by the panic in their voices, was that when the tide came back the water might flood into their cockpit and leak or break their companionway hatches before the boat started to float itself. Like most long distance cruisers their boat represented the majority of their life savings and was not insured. The next few hours were spent madly trying to reinforce their hatches, plugging all holes on their deck and cockpit, and using duct tape to seal everything. Below, everything was stored so nothing would happen when the boat leaned right over, and possibly becoming semi-inverted due to the steepness of the drop-off. The boat did lean almost completely on its side at low tide, but amazingly floated up on the tide with the water not quite reaching the top of the cockpit coaming. Needless to say they were very relieved and everything got back to normal with no damage done. I was in my usual Intracoastal Waterway mode gently sailing along in northern Florida with the electric autopilot engaged, reading a book. Suddenly, there was an explosion of rushing air right beside the boat! It really made me jump a mile as I had no idea what it could be. A quick check overboard and there was a Dolphin right beside the boat diving back under. It was the first time in my life I had ever seen a Dolphin so this was pretty exciting and I soon forgot about the scare. In a few minutes several others showed up and they all cavorted around the boat for the usual 15-20 minutes before getting bored and moving on. All the rest of the trip down the ICW they would put on a show a few times a day - like everyone, I really got a thrill out of it. During hurricane season I stayed at Vero Beach, Florida, as there is good areas where you could anchor surrounded by mangroves close by. During this time I also sailed up to Cape Canaveral to watch a Shuttle launch. It is really neat doing it in a sailboat as you can anchor quite close to the launch pad. The experience is really interesting. The main difference to watching it on television is the actual sound the rocket makes - it is almost overwhelming. The 9 million pounds of thrust shook my mast so violently I really though it was in danger of breaking. There is a very powerful low frequency rumble which seemed to be in tune with my mast's natural frequency. This is not picked up at all on a television audio. The other major difference is you get a much better perspective of how the Shuttle accelerates with time. At first it lifts very slowly then rapidly gains speed. You can see the solid rocket boosters fall away with the naked eye and I thought this was really amazing. Very worthwhile to see if you get the opportunity.